The people over at FatWallet have unearthed a fantastic sign-up bonus from Chase: $300 cash back after $500 spent within 3 months. 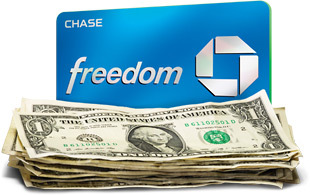 The Chase Freedom credit card is a great general usage card that offers 1% back on everything and 5% back in categories, which rotate throughout the year. Some categories are of special interest to the business traveler. In the third quarter, Chase is scheduled to have 5% back on all restaurant purchases. In the fourth quarter, Chase will offer 5% back on all hotel purchases. Disclosure: From time to time, I may receive a commission on products/services I recommend through this blog. For the offer referenced in this post, I do not receive a commission. February 17, 2012 in Credit Card Offers.